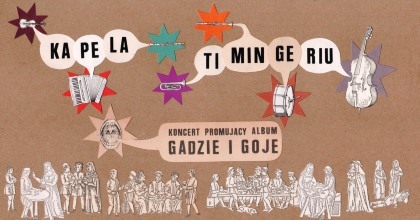 "Gadzie i Goje" is an album created by a group of individuals coming from different musical worlds, captivated by Jewish and Gypsy music. In the first studio album of Kapela Timingeriu, unpretentious love for music meets instrumental craftsmanship and attention to the band's sound. Double bass, violin, clarinets, trumpet, accordion, tupan and vocals accompany every situation, from wedding to mourning and back to dance. Overheard, encountered or taught by people they met on their way, the songs form a map of Kapela Timingeriu's trips and journeys. The album features gipsy songs from nearby Slovakia and Hungary, as well as traditional Jewish pieces from the Balkan countries and Eastern Europe. Caring for the good atmosphere, the recordings were made in a home studio in a Mazovian village under the supervision of Piotr Pac-Pomarnacki. The album was mixed by Marcin Szwajcer. Magdalena Piotrowska was responsible for mastering.